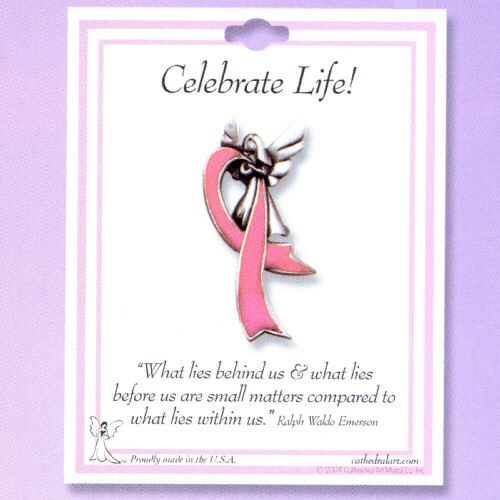 A Celebrate Life lapel pin is a great way to support Breast Cancer Awareness. Our Celebrate Life Breast Cancer Awareness Lapel Pin measures 1.5" in length. Wear our breast cancer awareness products everyday during the Month of October in support of Breast Cancer Awareness. Please call us for Volume Discounts. Love the pin. Haven’t seen one like it before. Today’s Price: $6.56 In Stock! I did not receive this. I received the other angel charm in error, which I think is meant for survivors. I believe I may send it to a friend who is a survivors. When this pin arrived, it was even prettier than the picture showed, I really like it! Additional Info We offer many Personalized Breast Cancer Awareness Products so that you may support Breast Cancer Awareness. Give our Gifts to a loved one or use our Cancer Awareness Keepsakes for any Special Charity Events or Breast Cancer Awareness Walks you are involved in. A portion of all sale goes to the Fight Against Breast Cancer Awareness.